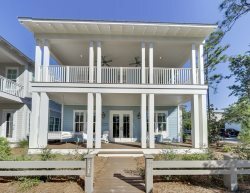 Perfectly Located Seacrest Beach Vacation Rental home + FREE BIKES! 4) CONSTRUCTION IS IN PLACE ALL OVER 30A. Our extended family enjoyed staying in Beach Thyme. It is a beautiful house and great location within Seacrest Beach. The large pool is nearby as is the beach via the convenient shuttle. We look forward to staying at Beach Thyme again!